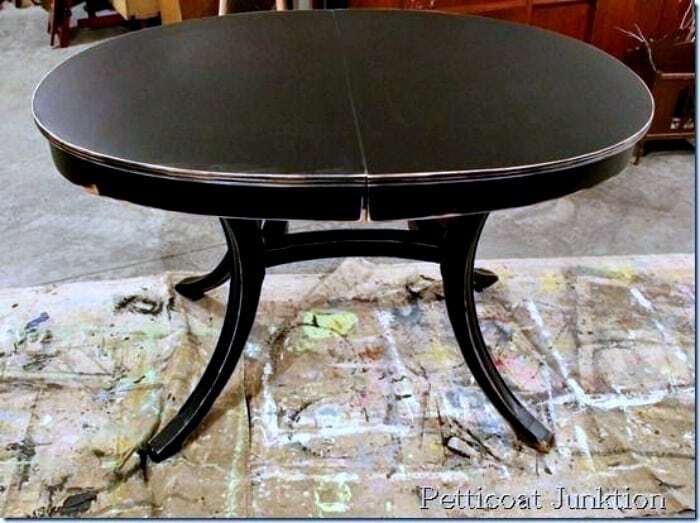 Have you given much thought to black paint colors for furniture? When I was putting this post together I goggled black painted furniture and found articles about “true black” paint colors. Never thought about a true black. I don’t have a favorite black paint color as such but I do have several black colors I regularly use and they represent more than one paint brand. You guys know I’m an equal opportunity paint brand girl which means If I like a paint that’s what I use and I’ll share the info with you. If I don’t like it, you won’t hear a word about it around here. You guys are the best. You commented and made suggestions about that chest of drawers I had trouble painting and then finding the right knobs for. Guess what?? I found new knobs and they look great. I think they look great. What do you guys think? Hobby Lobby was having a clearance sale on some styles of furniture knobs and I scooped up a bunch. Paying between $1-$2 each is much better than paying up to $8 each for them. Now I want to share pretty black furniture I painted in the past. 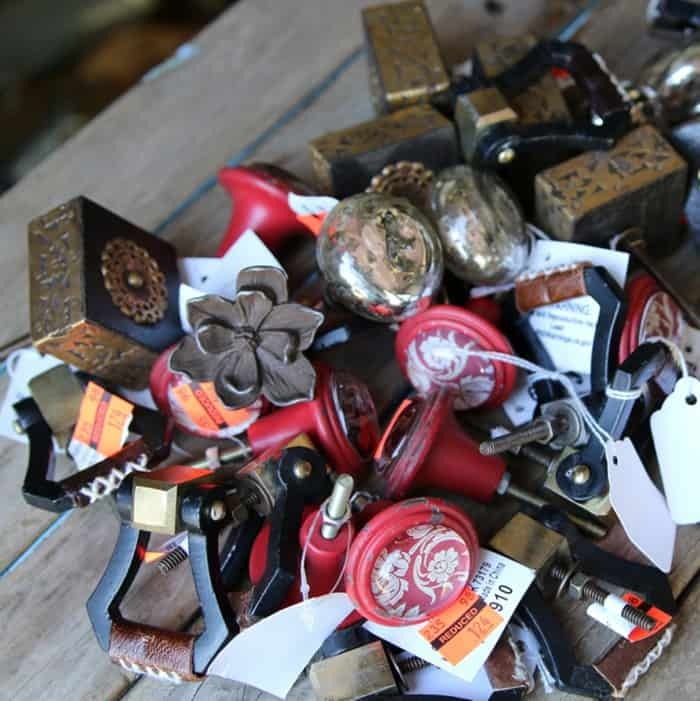 Some of the pieces are distressed, some are not, some are antiqued, and some are just painted black! Loving Black Paint Colors For Furniture (click any pink link for the complete furniture tutorial). Chest from He!!. This is the piece pictured above. Yes, I said a bunch of bad words when working on this piece. If you missed the makeover details you can read them here. Yard Sale Nightstands. I lucked up on a yard sale driving home from work one day and picked up the two nightstands really cheap. I love a good deal. 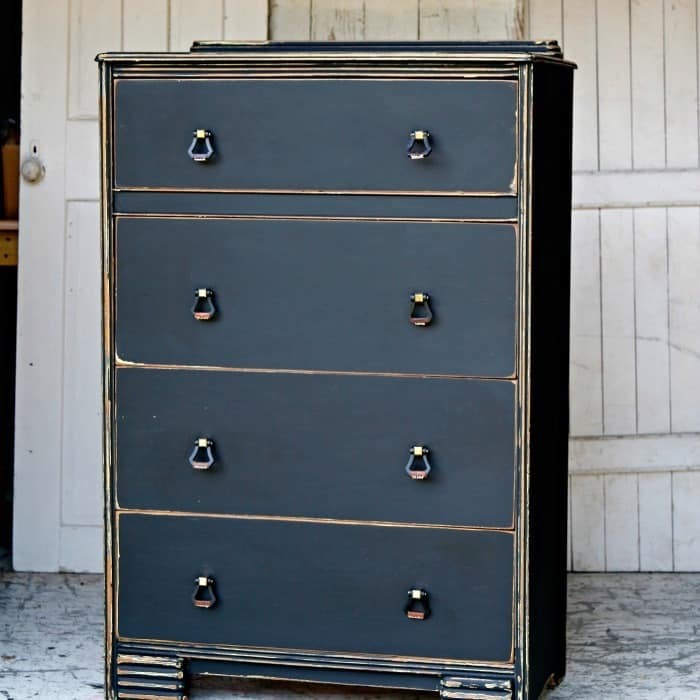 The details on the nightstands were perfect for distressing and black paint in the bedroom adds drama. Dining Room Table. I painted this table a number of years ago and recently deleted the blog post. I didn’t have any paint details in the post and doing housekeeping on the blog (always blog work to do).The paint is Beyond Paint and you can see I lightly distressed the paint. Black paint really looks good distressed and as you know I’m the “Queen of Distressing”. Side Table Painted Black. I painted these tables metallic silver and took them to my booth. They never did sell so I repainted them and the color of choice was …..black. These are very, very lightly distressed. Decoupaged Desk. The finish on this desk is satin latex. I like latex paint for furniture. There is really no need for specialty furniture paint. You can use special paint techniques and get just about any look you want with latex paint. Hepplewhite Sideboard Makeover. Not sure if you call this a buffet or sideboard. I think any term is correct. The style of the sideboard just called for classic dramatic black. Mirrored Vintage Buffet. Waterfall furniture is not my favorite but the buffets are cool. They still look stylish even with the rounded tops. The original mirror was the thing that caught my eye when I first spotted the buffet at the Nashville Flea Market. Heavily Distressed Cabinet. I called the paint on this cabinet heavily distressed but it’s more medium than heavy. Vintage Dresser Antiqued. I did it all to this dresser. I painted, distressed, antiqued with toner, and waxed with dark wax. How To Antique Furniture. The process for this chest of drawers was the same as the dresser above except for the type of paint. 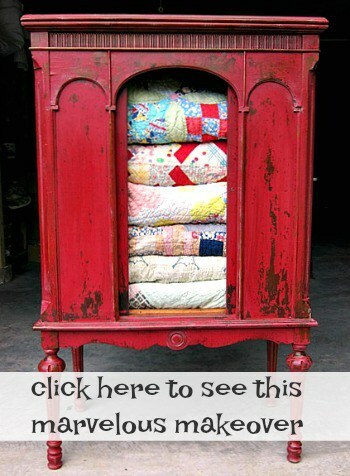 I wrote a complete tutorial on antiquing furniture in this post. Pottery Barn Knockoff. Now this one is heavily distressed but only on the bottom. I saw the Pottery Barn piece and loved it. I like my take on the Pottery Barn piece and the price is definitely better. Waterfall Chair Paint And Fabric Makeover. The fabric I choose for the chair seat was awesome. Not sure I really finished the chair like I should. The large solid chair back really needed a stenciled design or something. My Coffee Table. Sometimes your old furniture has to move on. I painted the coffee table black before taking it to the booth to sell. TV Stand With Storage. We definitely made changes to this piece. The new back, wire baskets, and knobs made all the difference. Serpentine Dresser Heavily Distressed. This piece turned out so pretty and the photos I take never do the makeovers justice. I wish all of you could come to my house to see the furniture in person. Wouldn’t that be fun. My Paint Furniture Workshops At one time I taught furniture painting classes at the shop. We had people bring in a piece of furniture and we furnished the paint and supplies.With a little guidance from Sara and I the furniture was usually ready to take home at the end of the day. At this workshop we painted a piece black, changed out the hardware, and decoupaged the top. Spray Painted Bar Stool. I love this project because it includes one of my favorite color combinations. 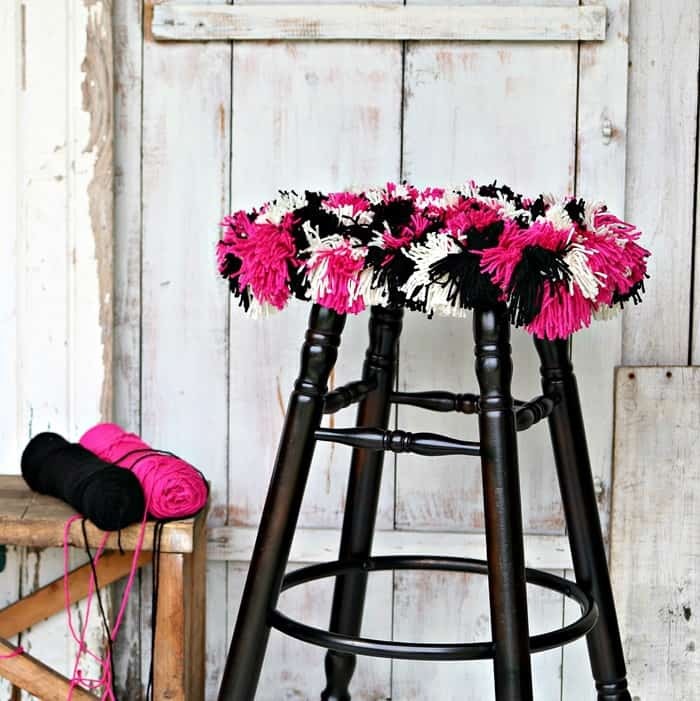 I spray painted the bar stool then added a yarn cover in colors of fuchsia, black, and white. Workshop Paint Party. Another project from my furniture painting workshops. Before and after photos. Metallic Stripe Chest, My Bedroom Furniture. You may have seen the metallic stripe chest that resides in our bedroom now. I loved this makeover so much I changed out the furniture in our bedroom. Pre-Mixed Milk Paint. Want milk paint without the mess and trouble of mixing? This product is for you. Typewriter MMSMP Color. This is not my furniture makeover project but I love it so much. The vintage dresser and mirror is beautiful and the paint finish is perfect. For something totally different from the black paint watch my video on How To Whitewash Furniture below…. Do you have one favorite from this bunch? Any inspiration for you? Leave me a note please. 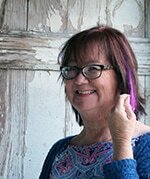 Find my favorite DIY supplies on the Petticoat Junktion Amazon Page here. You got my attention, because I love black. I have many items painted black. To me, it’s so classy. Thanks for sharing your fabulous black pieces. The new knobs are perfection! Loved looking at the other projects and got a great idea from one of them. Thanks for posting!